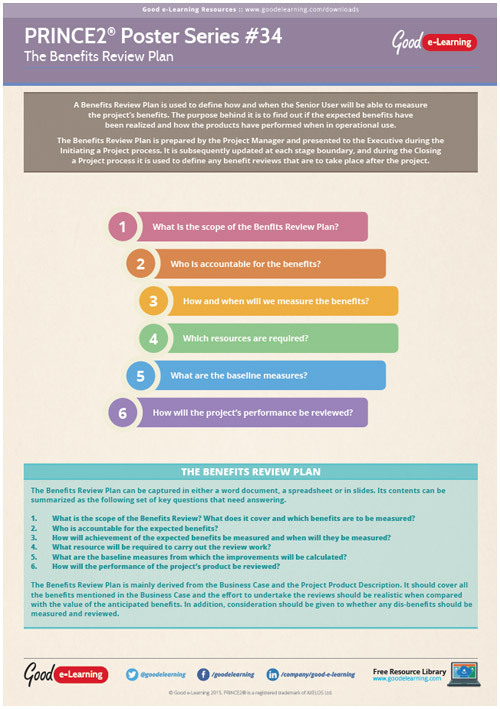 In this PRINCE2 poster we take a deep dive into the Benefits Review Plan in PRINCE2. The purpose of this plan is to find out if the expected benefits - as described in the Business Plan - have been realized and how the project’s products have performed when in operational use. The Benefits Review Plan is prepared by the Project Manager and presented to the Executive during the Initiating a Project process. Download this free project management learning resource and you’ll also get instant access to our entire library of 500+ Business & IT learning resources!